Remember: You cannot have “too much” wattage. 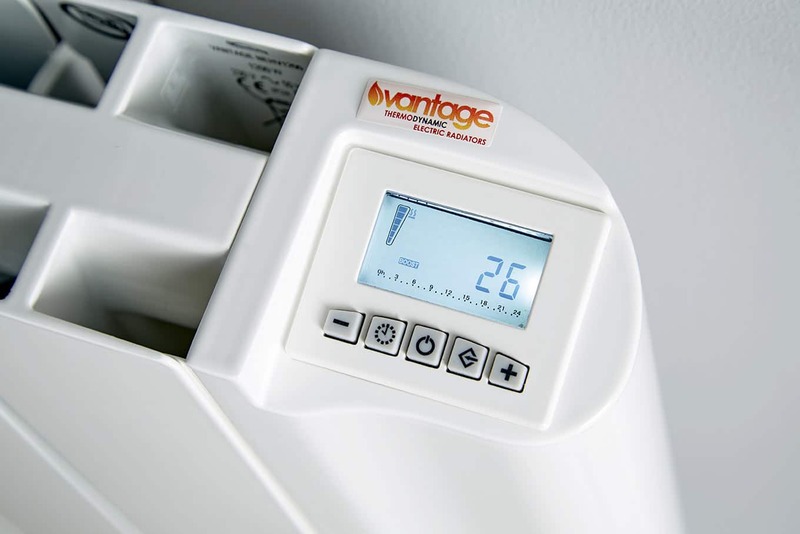 Vantage Radiators have proportional thermostats. They only draw as much power as is required to heat your room. We recommend using a larger radiator if you have any doubts. 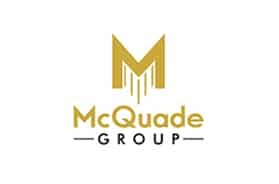 "In a market crowded with low-price aluminium options, the Vantage stands out and delivers with a perceivably better build quality and finish. Doing away with the usual plastic end panels and fascia in favour of powder-coated aluminium parts, it looks superb. Heat retention is excellent thanks to the sealed thermodynamic core so as you'd expect, the performance is as good as it gets. Now with further price reductions to the range, the Vantage really is something of a bargain." The Vantage Thermodynamic Electric Radiator is our best-selling model that delivers on both styling and heating performance. 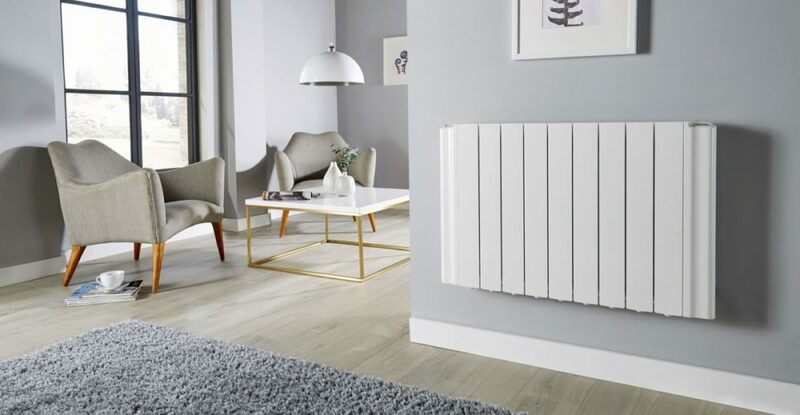 Packed with energy-saving functionality, the Vantage provides a high-quality electric heating solution that’s used widely in both domestic and commercial environments across the UK. Most noticeable about the Vantage Electric Radiator is the build-quality. Just like traditional central heating radiators, it’s made only from metal. Unlike similar-looking aluminium electric radiators with plastic end-panels and fascia, the durable powder-coated aluminium body of the Vantage is of a high quality that will not yellow, crack, or degrade over time. Enclosed within the beautifully-finished aluminium body is a sealed thermodynamic fluid core. This provides the thermal mass necessary to store heat energy and dissipate it gradually throughout the heating cycle. Retained heat is emitted through a combination of radiant and convected heat for a comfortable heating effect. Enlarged convection channels located through the centre section promote an optimal flow of warm air into the room. The elegant front panels provide a powerful yet comfortable radiant heat transfer from the liquid within. The AEM proportional thermostat feeds precisely the required energy into the thermodynamic fluid continuously, ensuring reduced fluctuations in room temperature and energy consumption. The heating effect is as you’d expect from a traditional central heating system. Your heated environment will never have felt so comfortable. 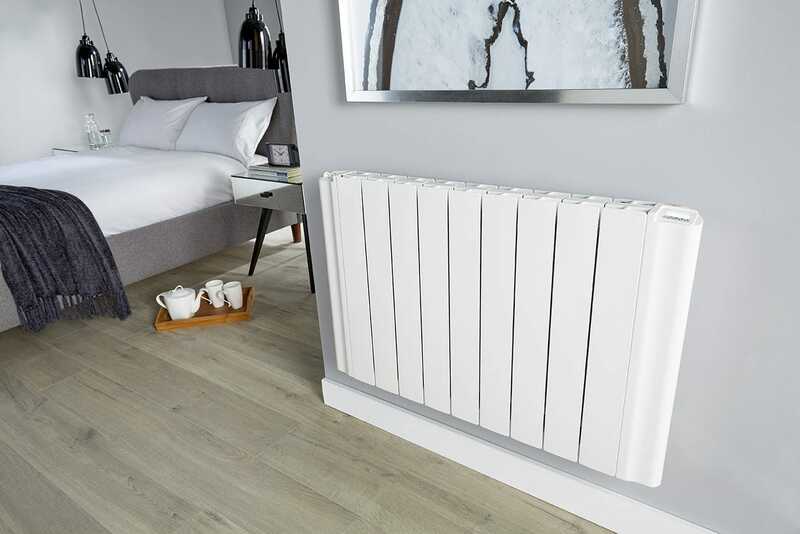 As with all of our quality electric radiators, the Vantage offers a full complement of energy-saving functions inside its clever electronic control. The Adaptive Start Function means you won’t need to guess how long a room might take to heat-up, or adjust your timings for cold spells – ever again. Simply set the times that you expect to use each room, and the Vantage will ensure your desired room temperature is met. No more chilly starts or coming home to a cold house! Other features include the built-in Open Window Sensor, which detects when a window has been opened nearby and pauses the current heating schedule until the window has been closed. There’s an Energy Monitor, which allows the user to see exactly how much power has been used over the course of the day, week, month and year, and even a Low Surface Temperature Mode – perfect for those who have young children. Core: Sealed thermodynamic fluid-filled. Low Viscosity. High thermal coefficient. Power connection: Moulded 3-pin plug. Can be removed for hard-wired connection to mains. 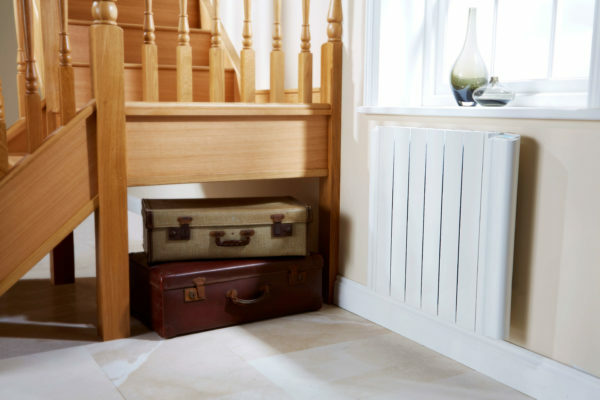 Vantage Electric Radiators are supported by a 10-year warranty period which covers the body of the radiator, the sealed fluid core, and the heating elements. During this time period we undertake to replace the radiator, should it become defective as a result of a manufacturing fault. Electronic controls are covered by a 2-year warranty period. They are interchangeable so can be quickly and easily replaced without special tools. Electronic controls can be supplied outside of the warranty period at cost-price. For full details of warranties please see Terms and Conditions. As with any larger high-value electrical appliance, quality electric radiators should never travel loose through mail depots and courier vans. Damages through the parcel delivery networks are common and unless handled correctly, the lifespan of a heating element can be shortened considerably. From our warehouse to your door, all EHE radiators are delivered by pallet logistics specialists with tail-lift vehicles. Packaged individually, your radiators are strapped to a wooden pallet and then wrapped in a protective covering to keep them in perfect condition. They cannot be dropped, thrown, or otherwise mistreated. Where access is restricted, we can use smaller vehicles. 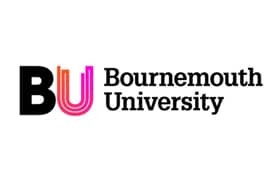 Order before midday and choose next-day delivery, or any other weekday thereafter. 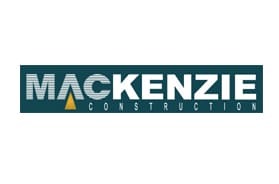 For delivery to Scottish Highlands/Islands/Postcode areas AB/ PH/ DD please call for a quote. 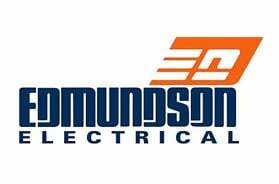 Excellent radiators and excellent service. I could not be happier with them. Since leaving the Economy 7 rate in favour of a better one and swapping storage heaters to Vantage radiators I have saved (excluding the initial purchase spend) somewhere around £500 over the course of one season. I am now not likely to use the heating again for 4 months or so during which time I am not confined to the day tariff imposed by the Economy 7. When the radiators were first installed, I requested some assistance in programming and was helped out by a very patient call handler. I have since spoken with others and have also been impressed. I would suggest these radiators to anybody in a similar situation. Nothing was too much trouble. 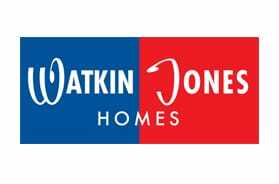 Thanks to all on the team for all your advice and patience during the selection of our heating. We purchased EHV Vantage heaters for some AirBnb properties and all were installed by Chris by the end of the week. 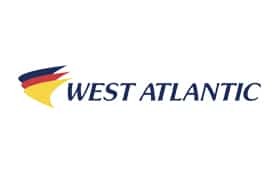 Assistance with setting them up and programming was excellent. Quality and efficiency of the heaters is very good much better than the old ones now removed. 10/10 for service. I received a follow up call after a week and another after a month from Electric Heating Experts. I am very confident in them and the radiators which look great and heat efficiently. Intelligent pre-heating program. Cuts waste and increases comfort. The “brain” that provides increased comfort and lowered consumption. Simple energy use reporting by day, week, month and even year. The only aluminium electric radiator of its type without plastic panels. Combat energy wastage. Auto-shut-off when a window or door is left open. Safe near children. Ideal for nurseries, care homes, public buildings. 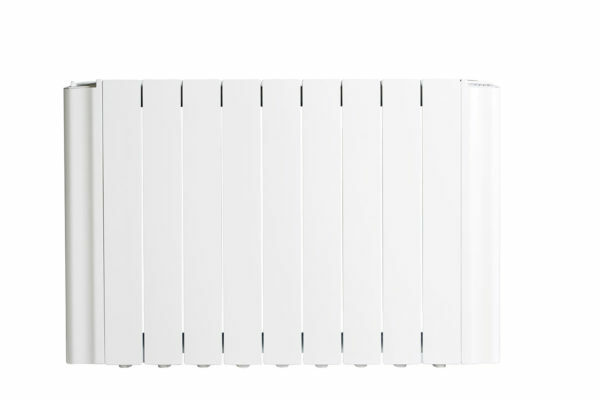 German-built electric radiators with multiple ceramic heat-retaining cores. Premium German engineered heating at low prices. 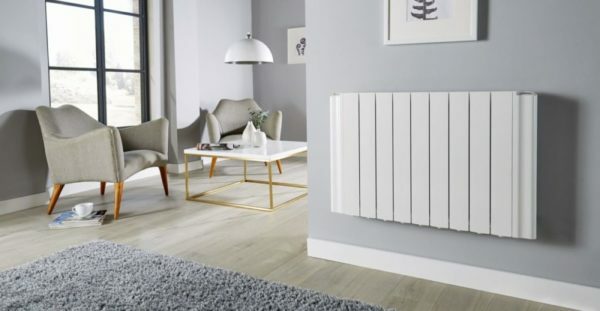 High-quality Italian electric radiators with a sealed fluid core. Comfort, efficiency, superior build-quality. Our most popular model. Spanish-build panel heaters with stylish look and great performance. Packed with energy-saving function at out lowest price ever.